On 16 July 1969, at 9.30 in the morning, Apollo 11 lifted off from the Kennedy Space Center in Florida. 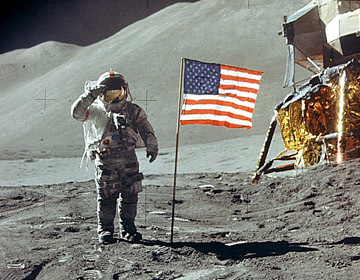 There were three astronauts – Neil Armstrong, Buzz Aldrin, and Michael Collins. The enormous rocket took three days to complete the 250,000 miles to the moon, travelling at six miles per second (21,600 miles an hour). Then it circled the moon 30 times, giving time to prepare for the landing. This flight was the beginning of man’s exploration of space. On July 25 1909, a Frenchman, Louis Blériot, became the first man to complete an air journey when he flew from Calais, in the north of France, to Dover, in the south of England. Blériot’s flight amazed the whole of Europe. People thought that such a journey was impossible. The flight wasn’t easy. 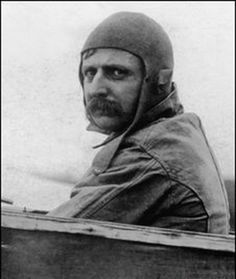 Mr Blériot, a 37-year-old engineer, couldn’t swim, so he didn’t want to come down in the Channel. He couldn’t walk very well because of an injury to his leg, and he didn’t have a compass. On the morning of the 25th, he took off at 4.30 from a field at the edge of a cliff. It took 37 minutes to complete the 22-mile journey. The plane flew at 40 miles per hour at an altitude of 250 feet. Everything went well until he flew into fog. ‘I continued flying for ten minutes, but I couldn’t see the land, only the sky and the sea. It was the most dangerous part of the flight. I wasn’t worried about the machine. It flew beautifully. Finally, I saw the land,’ he told reporters. When he got to Dover, he saw a French journalist waving a flag. He cut the engine at 60 feet and crashed into a field. The news quickly went round the world, and Mr Blériot’s flight was celebrated in London and Paris. He won a prize of £1,000. ‘The crossing was the start of modern aviation,’ said Louis Blériot, the grandson of the pioneer. On Lyricstraining.com you can enjoy learning English or other languages for free playing with the music videos and filling in the lyrics of your favorite songs. Ororo.tv is a fantastic website to learn English by watching TV serials, movies and videos online with subtitles in different languages.